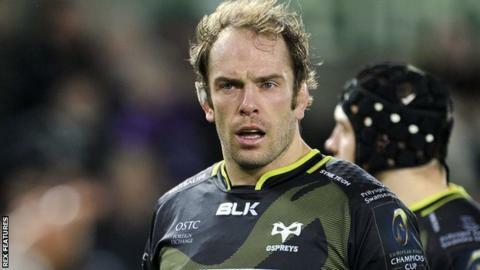 Ospreys captain Alun Wyn Jones has warned his team must improve if they are to complete a Champions Cup double over Bordeaux-Begles. The Welsh region are level with Exeter at the top of Pool Two after their 19-16 home win over the French side. But Ospreys struggled to subdue Bordeaux, who were reduced to 14 men for most of the second half. "Potentially you could say it was indifferent at certain points of the game," admitted 30-year-old Jones. "There were a lot of unforced errors early on and we probably tried a bit too hard at certain times, two things we can control." The Bordeaux trip on Saturday falls at a crucial time of the season for Ospreys. They follow that match with a trip to neighbours and Pro12 leaders the Scarlets on Boxing Day, before hosting Newport Gwent Dragons on New Year's Day. "It's the business turning point of the season," added Jones, speaking during an Ospreys squad visit to Swansea's Morriston Hospital. "When we go into the New Year, we'll see where we end up off the back of the Christmas derbies and going into the final rounds of the Champions Cup. "It's a tough turn of the year, but hopefully it can set us up for the back side of the season." Flanker Justin Tipuric added: "We've started the month off well but it gets harder and harder now. "We've got to go away to Bordeaux, the best-supported team in France and try to get a result." Jones and Tipuric were part of an Ospreys contingent handing out presents and posing for photos on the children's ward at Morriston Hospital, while other members of the squad were at the Princess of Wales Hospital in Bridgend. "There are a lot of boys in the squad that want to do it, we've got a lot of fathers in the squad," said Jones. "It's nice to get round and see people to try to put smiles on faces, to give out Santa hats and gifts. "It's not just to see the patients and give them a smile and help them on the road to recovery, but also the families, and the doctors and nurses who do a great job."